These techniques each have their own advantages and disadvantages when dealing with specific matrices and archaeological problems. However, by providing access to all three techniques in one laboratory, we are able to increase their availability to archaeologists who would otherwise be unable to afford them. Further, by making these techniques available to the archaeological community, we hope to increase collaboration between archaeologists and analytical chemists. 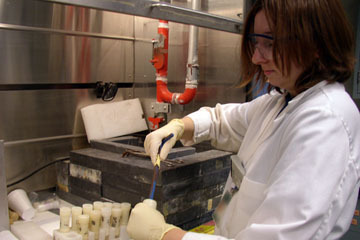 Neutron activation analysis (NAA) is a technique useful for performing qualitative and quantitative multi-element analysis of major, minor, and trace elements in samples. For many elements and applications, NAA offers sensitivities that are superior to those attainable by other methods, on the order of parts per billion or better. In addition, because of its accuracy and reliability, NAA is generally recognized as the "referee method" of choice when new procedures are being developed or when other methods yield results that do not agree. 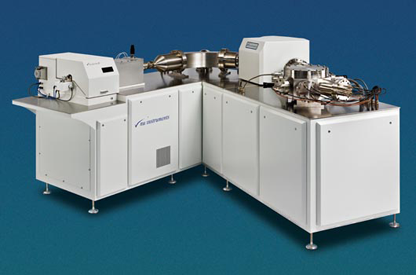 X-ray fluorescence (XRF) spectrometry is an elemental analysis technique with broad application in science and industry. XRF is based on the principle that individual atoms, when excited by an external energy source, emit X-ray photons of a characteristic energy or wavelength. Modern XRF instruments are capable of analyzing solid, liquid, and thin-film samples for both major and trace (ppm-level) components. The analysis is rapid and usually sample preparation is minimal. Inductively coupled plasma mass spectrometry (ICP-MS) is a very powerful tool for trace (ppb-ppm) and ultra-trace (ppq-ppb) elemental analysis. ICP-MS is rapidly becoming the technique of choice in many analytical laboratories for the accurate and precise measurements needed for today’s demanding applications. Since 2000, researchers at the Archaeometry Laboratory have been using ICP-MS to address archaeological questions. Multi-collector inductively coupled plasma mass spectrometry (MC-ICP-MS) is an analytical method for determining isotopic ratios at incredibly high resolutions. Ratios of Pb and Sr isotopes, among others, can be highly diagnostic of geological formations, and thus the ability to measure these ratios is an exciting new capability for provenance studies. The Archaeometry Laboratory is presently accepting projects for MC-ICP-MS; you can follow development of our facilities and analytical capabilities at Overview of MC-ICP-MS Facilities at MURR. The MURR Archaeometry Laboratory routinely conducts analyses in support of compliance and regulatory projects conducted under Federal and State historic preservation laws. Compositional analyses of chert, obsidian, pottery, and other materials can significantly enhance the depth, quality and value of compliance and regulatory archaeological projects. Cultural resource management firms and government agencies have long recognized that the archaeometric studies can be an integral part of evaluating the potential significance of archaeological and historic resources. For example, in southeast Missouri, where the National Park Service has funded hundreds of analyses to create a ceramics compositional database, NAA has been used to successfully identify sources of individual pottery sherds. For a listing of past and current clients using MURR, click here. Projects submitted under our standard analytical rates are given the highest priority for preparation, analysis, and interpretation. Results are reported in detailed technical reports describing our procedures, analyses, and interpretations of the data. Reports include identification of geochemical groups, comparisons with other relevant data in the MURR database, and address any specific research questions provided by the customer. In the case of obsidian, source-attributions are made (if possible) for individual artifacts. Our standard analytical rates are ideal for customers seeking a rapid turn-around time. This is ideal for compliance/regulatory projects involving cultural resource management actions, for small projects involving a handful of specimens, for researchers not carrying an academic affiliation, or for researchers who do not have time to wait until the biannual proposal-review process. Although we strongly encourage all of our customers to publish their results, there is no direct obligation to publish data generated under our standard analytical program. The Archaeometry Laboratory's NSF-subsidy program increases availability of analytical methods to archaeologists and encourages increased collaboration between archaeologists and analytical chemists. To achieve these objectives, we use a portion of our National Science Foundation grant to subsidize select research projects, thus deferring operating costs inherent in our standard analytical rates. Applicants should be graduate students or faculty members from US-based academic institutions. Projects conducted under this program are considered collaborative and acceptance to this program carries with it an obligation to make public the results of our work. Projects conducted under the NSF-subsidy program carry an obligation to promptly publish results with laboratory staff. Investigators participating in our NSF-subsidy program are required to particpate in our data management and sharing plan. Investigators from foreign countries and from non-academic institutions are not eligible for this program, but other cost-reduction strategies may be possible. We encourage such researchers to contact us and provide a research proposal. Clients interested in the elemental analysis of other kinds of materials should contact the MURR Analytical Chemistry Group.